Mackenzie Bosse, a nurse in the Medical Intensive Care Unit at Penn State Health Milton S. Hershey Medical Center, helps a patient feel more comfortable. In nursing school, Chelsea Stoner learned all the necessary skills—patient assessment, medication calculations, charting—to train her for a career in health care, but nothing could prepare her for the raw emotions she would encounter. In time, Stoner, a registered nurse for four years, learned how to balance the many aspects of her role—technician, caretaker, physician partner, encourager—and contributor to some of the most important moments in a person’s life story. Being a nurse takes grit paired with tenderness, methodical diligence and on-the-spot resourcefulness, nerves of steel yet words of compassion. It’s a “calling,” people often say, with admiration but little understanding of what the job entails. To promote awareness of the power behind the compassion, photographers Jen Foster, Donovan Roberts Witmer and Jeremy Hess of The Premise Studio in Lancaster, Pa., spent two days taking photos of nurses in the MIMCU and MICU of Hershey Medical Center. The result is “Carry the Day: The Power of a Nurse”—starkly raw and emotionally real images of nurses demonstrating poise under pressure, pairing skill with hope in each critical and quiet moment of care. Watch a video for National Nurses Week featuring the photos and see the Medical Center’s Flickr page below. There’s MICU registered nurse Laura Waligora, choreographing care for her patient suffering with end-stage fibrosis. There is no cure, but there is still quality of life to preserve. “This felt like a normal day to me,” she said simply about the day of the photo shoot when she was coordinating therapy and treatments with the rest her patient needed to preserve his limited energy. There’s MIMCU registered nurse Jessica Eyer, facing a busy day of assignments but choosing to focus first on her patient. “I may not always look good on ‘paper’ in terms of being caught up with my charting, but my goal is to be there for the patients for moral support, encouragement, addressing pain needs and doing my best to make them happy,” she said. There’s Mackenzie Bosse, MICU registered nurse, looking into the eyes of her patient—a quadriplegic from a young age—and seeing the person behind the medical condition. His positive attitude gives her day a lift. Being able to enter the rooms of patient after patient with a smile and a positive word, even when the prognosis is grim or the task at hand will bring pain, takes teamwork. Bosse credits both the senior nurses and new nurses in the MICU with inspiring her. Each brings a valuable perspective and mutual support, she said. Foster mentioned the photo project to her friend Jessica Oehme, a registered nurse in the MIMCU, who told her sister, Jenn Oehme Knepper. A facial expression, an affirming word, a squeeze of the hand—small gestures combined with expert knowledge and competency—that “carry the day” for a patient who wonders but has little control over what that day will bring. 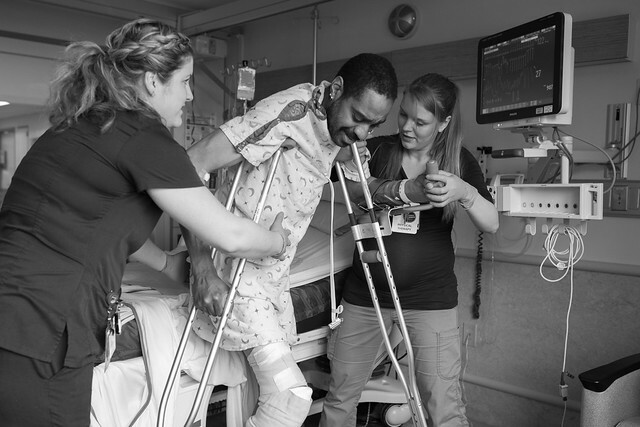 Jenn Oehme Knepper, a registered nurse in the critical care float pool at Hershey Medical Center, helped facilitate the connections at the hospital to bring the “Carry the Day: The Power of a Nurse” photography project to life. Entry filed under: Features. Tags: Nurses Week, Nursing.